This post is a little out of the ordinary but is important because it concerns the readers and, especially, the commentors on this blog. I do very much appreciate the comments which are made as they often give me new ideas to try as well as provide some pleasure knowing that the blog is being enjoyed. Recently, however, there have been some questions asked and, when I try to reply on the blog, cannot do so. I have diligently searched to find the cause of this problem and have yet to find it. Just to make sure that no one thinks I am ignoring him, I will answer a couple of the questions right now. It was an educated guess. Prototype photos show a dark color which could be red or green. I have enough BCR cars on the railroad so I chose green. I also have original specs for another car which does indicate green with vermilion ends so I guess that green is an appropriate, if not practical, color. And to Gregory Rich who wondered where Pittsburg, California is located. Pittsburg is on the San Joaquin River just east of its junction with the Sacramento River. It was a coal-mining town initially called Black Diamond (among a few other names). The original lettering on the car was for Waverly Oil in Pittsburgh PA but my friend changed it to California since there was a similarly-named city. He did the revisions and the original model so I cannot claim any credit except that of being a happy recipient. If anyone has any suggestions on how to solve my Reply issues, I would appreciate hearing it. You can email me at dlball1899@gmail.com. Thanks for reading. 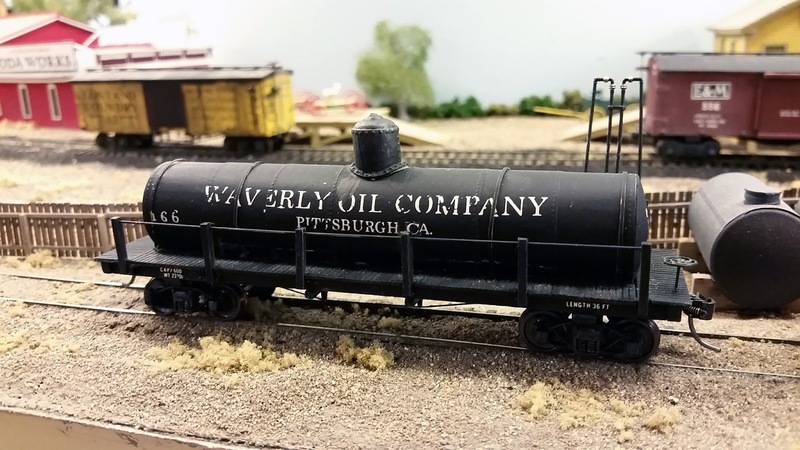 The Waverly Oil tank car sits on a siding in Oakdale awaiting transport to the to-be-developed oil loading facility at Waverly. At least that's the way the newspaper should have published the "event." In reality John Breau, one of the S&C operators, produced a tank car today that he had built over 40 years ago from a La Belle kit. Since he models the early 1950s, he had no use for an older prototype car so he refurbished it and gave it to me. You can see that it is lettered for the Waverly Oil Company based in Pittsburg, California. Since Waverly is a siding on the railroad, I naturally assumed that someone had struck oil in its vicinity. For those not familiar with California geography, Pittsburg is a town on the San Joaquin River and could very well have been offices for an oil company. At that date, the routing of the car is unknown [i.e. the car card and waybill have to be printed]. Of course, this also means that I have to build some way of loading the tank car but Waverly still needs a grain warehouse anyway so locating a tank car platform should not be a problem. Thanks to John for adding an interesting car to the railroad. Two Locomobiles on the main street of Burneett's. The green and blue colors, among others, were factory options. 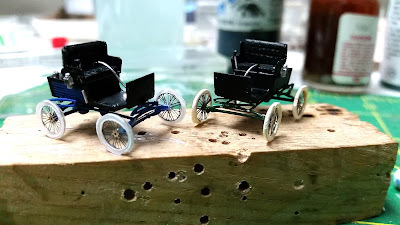 I picked those since they matched the color of my Locomobile and that of a friend's. "According to the Oakdale Leader, two "horseless carriages" were spotted traveling through Burnett's this week. Both were powered by steam and driven by persons who otherwise appeared normal. The vehicles sped through town traveling at least 15 miles per hour and were last seen on the Knight's Ferry Road east of Oakdale." car contains the water tank. You can see the tufted upholstery on the left-hand car. That's the history record. 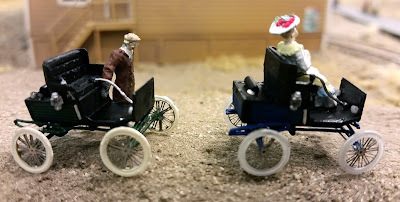 The actuality is the completion of two 1900-era Locomobile steam cars. Once the most popular car in America, the Locomobile company switched to gasoline cars in 1902 as did almost everybody else. Driving an antique steam car is somewhat of a thrill. Even though the speed is not that high (25-30 mph), you feel like you're speeding down the street while sitting on a card table. How do I know? 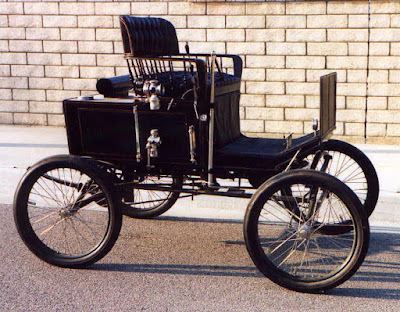 I have a 1901 Style 02 Locomobile in my garage which I restored back in the 1990s. 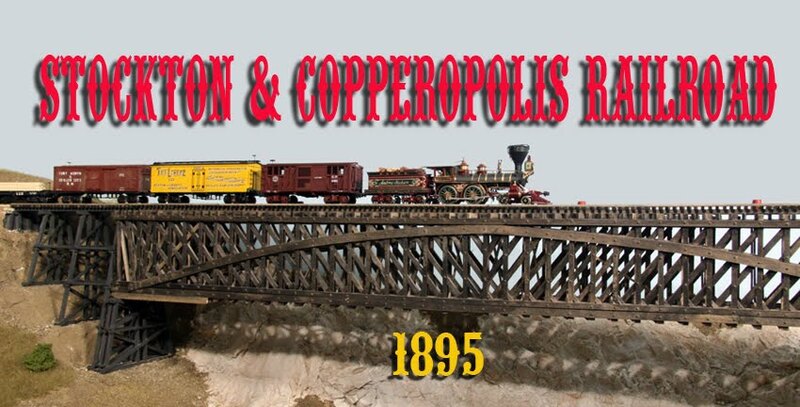 Ever since then, I wanted to make a model of one for the railroad. Yes, it is slightly anachronistic but I had fun building them. The bodies of the two cars were made using 3D printing. I worked up a drawing in Sketchup and then sent it to Shapeways to do the actual printing. There are three parts: the body, the chassis and the tires. When I received the parts from Shapeways, I still had to fabricate springs, the tiller and other small parts. Photo-etching enabled me to produce the wheel spokes which fit into a groove in the tires. On the workbench before being placed on the railroad. Although all this may sound somewhat high-tech, each part is actually not too bad. Sketchup is a free program which can be downloaded. It takes a bit to figure out just how to get what you want but there is plenty of documentation. The photo-etching was done with the Micro-Mark etching kit in a sink in the bathroom. Again, not very difficult. Seeing the parts you working with may be another story. I recommend the Optivisor which I have used for years. If you can see it, you can work with it! Upholstering the car was little more difficult. The prototype used leather in a tufted pattern. Not having any wish to actually use fabric, I substituted a piece of styrene and scribed it where the folds would fall. A small drill was used at each intersection to make a small dimple which would represented the buttons. The author's 1901 Locomobile. Note that the tiller is now on the side of the car rather than the center. This was an improvement in 1901 as was the ability of the brakes to work when going backward. Just a bit more history of the car and the railroad. 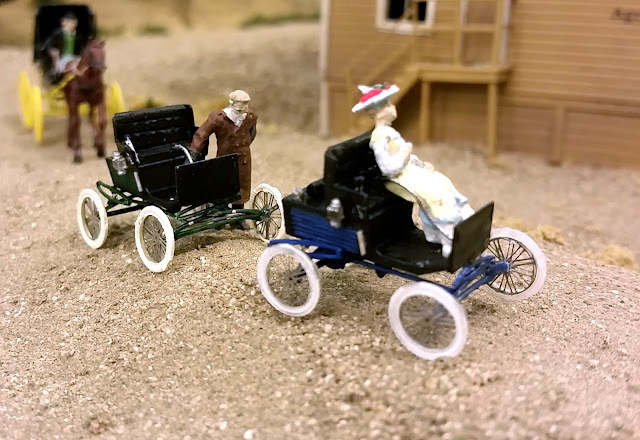 The first car into Yosemite was a Locomobile in 1900. In 1901, two Locomobiles drove from Stockton to Yosemite. There was a nice article in the August 1902 Overland Monthly about their adventures with photographs. I found it a nice read and it is available on line.